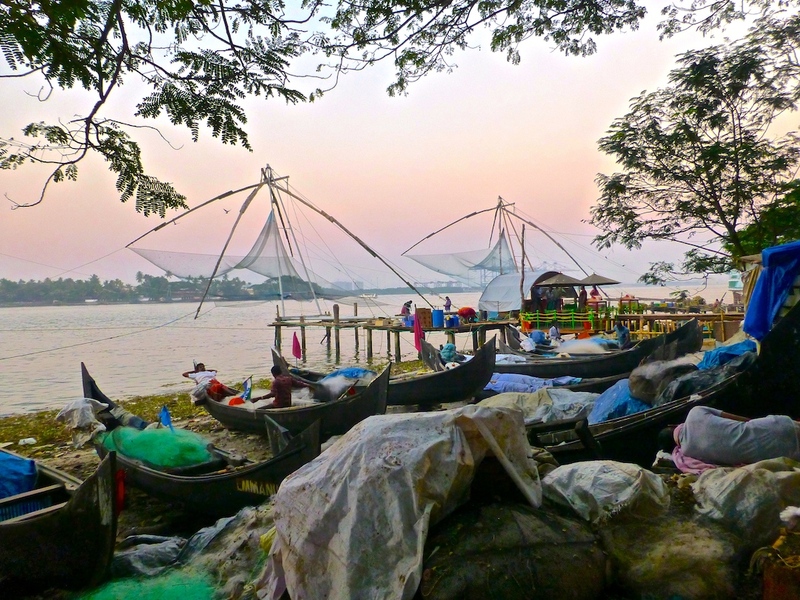 We planned 3.5 weeks in India, and most of our time was TBD but for two places: Varanasi and the backwaters of Kerala. I had read that spending time on a boat in the backwaters was a relaxing experience that also offered a glimpse into village life in southwest India. My expectations were high, and I was not disappointed. I arrived in Kochi fully intending to arrange a two-night motored houseboat out of Alleppey, about an hour and a half south. There are many options for a backwater experience including a day trip on a public ferry between Kollam and Alleppey. My comments on all except the trip we did is from reading and word of mouth, so I will write as though it’s fact but I cannot confirm. Alleppey is by far the most popular place for booking houseboats, and these days there are hundreds if not more than a thousand. Many of these are fairly luxurious with air conditioned bedrooms and an upper deck with sofas. It sounds great, but word is at least at this time of year the Alleppey area has gotten so crowded that you might wait in a line of boats to make a turn. And the water is oily. In Kochi we popped into Walton’s Homestay to see if they arranged backwater tours, and Mr. Walton fortuitously directed us a couple doors down to his friend Stanley Wilson. Stanley told us that he worked for years in Alleppey, but that the original intent of a relaxing float had become a victim of its own success. As more and more tourists, both domestic and foreign, wanted a houseboat tour, the boats became bigger and more luxurious and the area more crowded and polluted. He offered a simpler and more eco-friendly alternative. Stanley arranges punted boat tours from a village about halfway between Kochi and Alleppey, with solar power during the day when the boat is out on the water. Punted means that men propel the boat by pushing long bamboo poles on the water bottom. Except when we passed through a canal lined with stone walls, when the boat men disembark and pull the boat using a rope. They do this because punting is hard work, as Jenni and I both learned when we gave it a try. There is no air conditioning and no upper deck, but also no noise. Stanley promised our money back if we saw more than three other boats, and I am happy to say he still has our money. After an hour drive from Kochi, we arrived in the village and boarded the boat at 10:30 am. We were accompanied by two boat men and Manu, a great cook who speaks English very well. The boat is made of wood and bamboo and has a simple kitchen in back, a basic bedroom and toilet with sink, and a front area with a dining table, some comfy lounging chairs and a side table. The front is covered so you do not roast in the direct sun all day. As we glided through the backwaters we passed between wider and narrower channels, surrounded by palm trees and many birds including ducks, egrets, cormorants, storks and kingfishers. We saw tiger prawn farms and men in canoes laying out fishing nets in a circle. There were lots more Chinese fishing nets like those we saw in Kochi. The villagers onshore always stared and almost always waived and said hello. Kids were full of smiles and relentlessly asked for “one pen, please.” So if you can fit them in your luggage, bring a boatload of pens to throw to these adorable youngins. And one group of boys who walked alongside our boat for a while said they love Justin Beiber, so maybe bring some Belieber paraphernalia while you’re at it. While much of India is frenetic, the backwaters epitomize relaxation. Jenni and I each commented that we could not recall the last time we felt so relaxed…perhaps on the second half of our honeymoon in the Maldives. The food was delicious and enormously apportioned. Coffee and tea were offered multiple times. We had fresh fish with each lunch and dinner plus rice, okra, curries, freshly made chapati or paratha and watermelon, pineapple or banana for dessert. The first night we drank a bottle of Sula chenin blanc that we purchased in Kochi. We knew Sula from the bubbly we had the first night of our honeymoon last year in Jodhpur. The winery is located in Nashik in the state of Maharashtra, India’s burgeoning wine region. Time may tell, but for now Napa and Bordeaux ought to rest easy. The one thing about this arrangement that may be better on the Alleppey boats (I am not sure if it is the case or not) is that at night we are anchored yet also docked back at the village. In other words, the boat is pointed out towards the water so you still get some of the feeling of sleeping out on the water, but it is not the same as being anchored in the middle of a lake. On the bright side, when docked there is electricity so you can charge devices and you can take their dugout canoe for a spin. We could also hear music and fireworks both nights, as if to remind us this was still India. But the noise subsided before bed time. Some of the fireworks were so loud. Remember that if you are in India and it sounds like war is breaking out, stay calm. Most likely it is not. On our first day before lunch the boat docked across a wide waterway and we walked five minutes to the Arabian Sea. There were so many colorful wooden fishing boats and I helped push in a new arrival loaded with mackerel and catfish caught in a chicken wire like net. We had made arrangements with Stanley to spend the first day and night on the boat and the second day onshore and sleeping in the village home stay. We so enjoyed being out on the boat that on Saturday morning we called an audible and switched to the one of their three boats that was free that day. As I wrote above, I have no personal experience with a motored houseboat from Alleppey and I imagine it could be wonderful. Among other things, two-bedroom houseboats are offered which is not so at Stanley’s village. These boats might also anchor out in the water, which sounds nice. If you are interested in going that route, this post from globetrottergirls.com seemed sensible and helpful. Our taxi from Kochi cost Rs 600 and each night on the boat was Rs 4,000 with all meals included. Had we stayed in the village that night would have cost Rs 2,500 without AC or 3,000 with AC. It is worth noting this was a good reminder that sometimes you just have to trust people. We paid Stanley in full in advance. This is slightly unusual, but he came recommended from a hotelier who seemed trustworthy and was recommended in my guide book (the hotelier, that is), and Stanley has a permanent office on a busy tourist street in Kochi. Two nights on the backwaters was perfect for relaxing, reading and writing. I made it through 500+ pages of Mandela’s book Long Walk to Freedom. If you want a quintessential south India experience, I highly recommend unwinding here for a couple days. This entry was posted in Asia, India, Kerala Backwaters, Uncategorized and tagged alleppey, backwaters, houseboat, India, kerala on December 24, 2013 by aleavitt77. 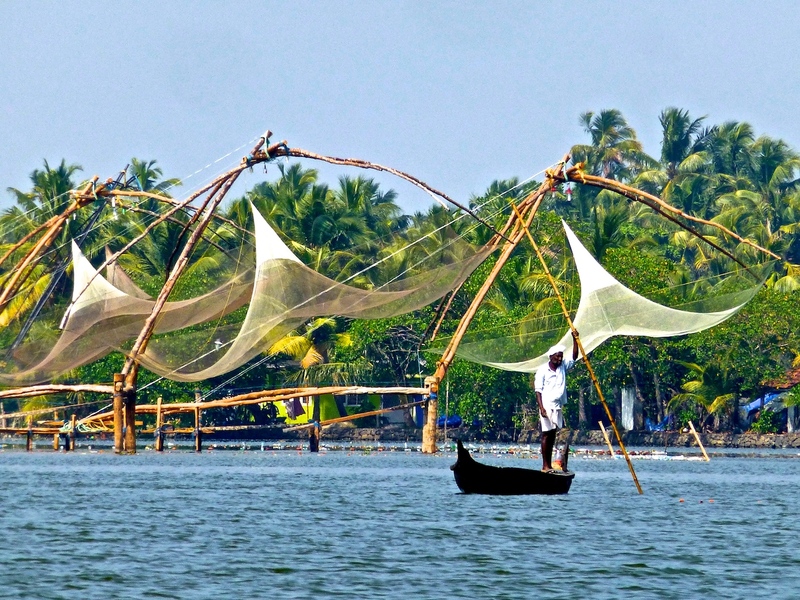 Kochi (or Cochin) is a coastal city in the state of Kerala and a popular destination for tourists. We spent three nights and two full days here and found it to be a nice mix between city and village feel and a great place for easing into India. It did not take long to get our first taste of the brutal Indian traffic when our modern airport public bus took more than two hours to reach Fort Cochin. Spacious and calm enough to start, the bus quickly became very crowded. Though nothing like the older, regular public buses. On the way we passed countless Bollywood billboards and crossed Ernakulam, which is the more modern and big city part of Kochi. Most visitors stay in Fort Cochin which occupies the western peninsula along with Mattancherry, and I recommend you do the same. Unless perhaps you stay at the Taj on Willingdon Island. After checking into our spacious room at Chiramel Residency, we had dinner at Dal Roti, a very popular and cheap restaurant that happened to be next door. The butter chicken was tasty and we had our first of many parathas, the doughy delicacy we fell in love with on our honeymoon. Albeit the versions we’ve had in southern India have been a little larger and more fried. 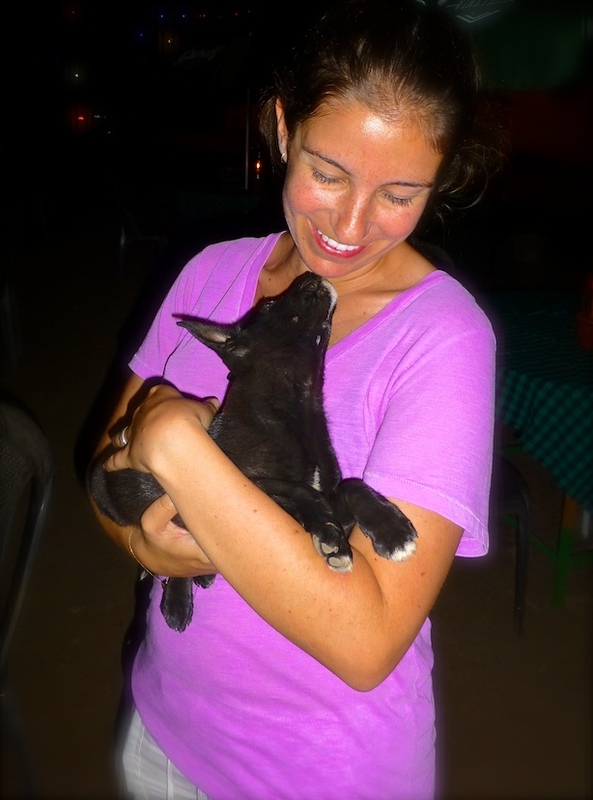 Eager to explore a little, we walked over to a bar and met a few locals and their adorable puppy named Blacky. Whenever we tell people we are from America, one of the first things they say is “oh, winter, it’s really cold, yes?” Then we get to chuckle and say “not in Cali.” And Obama may not be that popular in the US, but he is here. Tuesday was mainly a work day, planning out some more of our time in India, getting my SIM-switched iPhone to function, etc. It is shocking how inexpensive medicine is here vs. in the US. Jenni has had sinus problems for a while so we bought a 3-pack of Zithromax for…$1. In the early evening we walked over to see the Chinese fishing nets and the area was crowded with locals and tourists. We split Malabar prawn curry and a great mango lassi for dinner at the Old Courtyard. Wednesday we planned to walk all day but had barely escaped our hotel when an enterprising tuk-tuk driver scooped us up with promises of a good tour for Rs 60/hour. Our first stop was Saint Francis Church, the first built by Europeans in India. It is historically interesting and Vasco da Gama was buried here before his body was later removed to Portugal, but the structure itself is nothing special. The Santa Cruz Basilica is a far grander church. 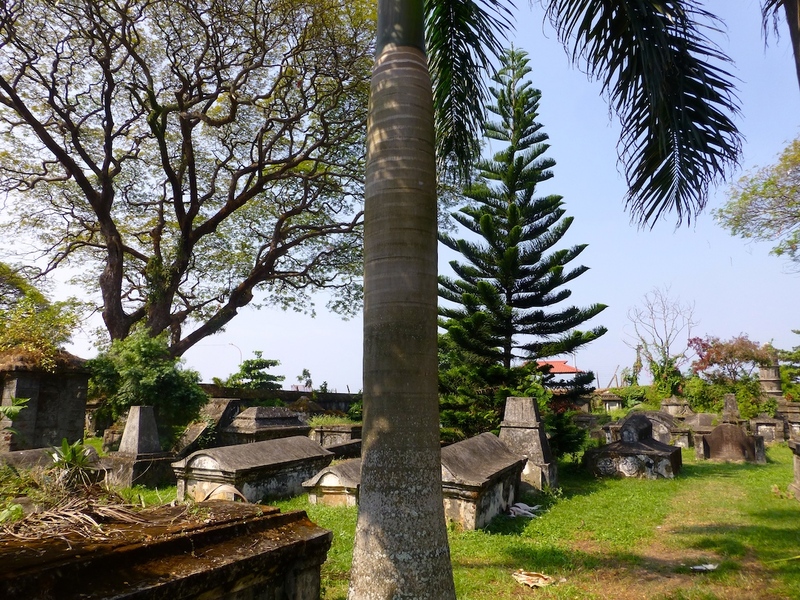 Next we saw the pretty Dutch Cemetery before continuing to the dhobi khana where laundry is hand-washed by members of a low caste. This was a fascinating stop for a glimpse into a long-standing practice that is probably going the way of the dodo in the coming years/decades. Women and lungi-clad men scrub garments and linens before whipping them onto rock surfaces, the precursor to our spin cycle. The cloth is then air dried by hanging between rope braids and finally it is ironed, folded and sorted. While we saw a few jury-rigged electrical irons, many are heated by burning coconut husk. This method requires more skill to maintain the proper temperature. Either type weighs about 20 pounds. From here we crossed to Mattancherry and saw the old Jewish synagogue which was impressive. It is small but ornately decorated with hand-painted blue and white tiles, colorful lamps and a red and gold Torah ark. At one time there was a substantial Jewish population here but most emigrated to Israel in the 1940s, when they left behind furniture and other large possessions that ended up in antique shops in the area. For lunch we considered Kayee’s and its Rs 100 chicken biryani but the atmosphere was lacking so we opted for a water-side meal at Seagull. The chicken biryani there was quite tasty. After lunch we visited a spice warehouse with turmeric, cardamom, nutmeg, cinnamon and star anise, and then we saw a ginger seller. This was neat as our guide pointed out where they dry the ginger a bit before soaking it with chalk and lime (the fruit) then drying it a lot, after which it lasts 7-8 months. The contrast of the monochromatic ginger pile and art-covered courtyard walls made for a nice scene. Our last stop on the tour (aside from buying some wine, for our backwater trip, through the bars at a government shop) was the Dutch Palace, which was actually built by the Portuguese though the Dutch augmented it. It is bland from the outside, but holds some impressive mural paintings along with a smattering of palanquins and old weapons. 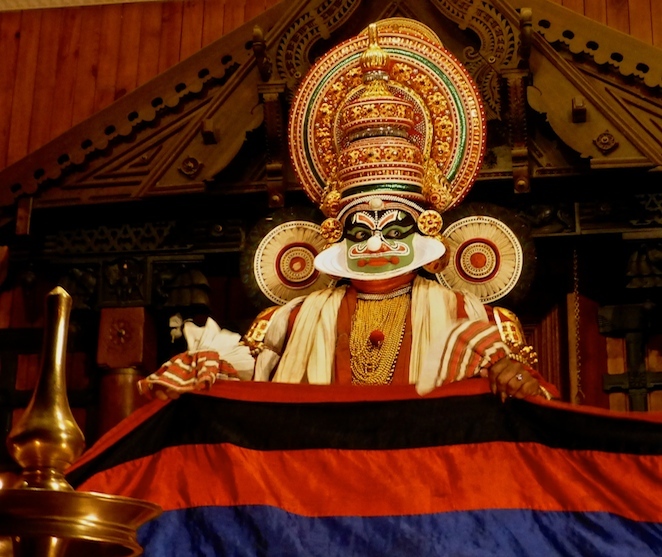 Kerala is known for its kathakali theater performances. We caught a 5 pm show at the Kerala Kathakali Centre. Though a tad slow at times, overall it was superb and a highlight of our stay. The main show began at 6 pm, but attendees can arrive at 5 pm to watch the elaborate make-up process. These gents paint their faces using all natural ingredients, generally different stones grated with coconut oil. And the emcee was masterful hand-sprinkling sand into geometric shapes on the floor right by our seats. In Kathakali there are no words, rather elaborate eye and facial expressions along with hand movements are used to communicate. The pre-show included a demonstration of techniques and live percussion accompanied the show. Traditional performance in villages can last an entire night, I think we saw the equivalent of one act in a play. The Kerala Kathakali Centre offers a host of other programs, too, such as yoga, music, martial arts and more. After the show we ate at Malabar House, an upscale boutique hotel with a courtyard restaurant. I enjoyed the Lamb Kerala we split. It is not the best value, but when you can have live music in an appealing setting and pay $11 for a lamb dish it’s hard to get too upset. The exchange rate was about 62 Indian Rupees per 1 US Dollar. US citizens require a visa prior to arrival. It is a fairly cumbersome and expensive process. We worked with Travisa and paid up for 10-year multiple entry visas so we can come and go as we please. Often “hotel” really means a restaurant, not lodging. Most accommodations double as a travel agent of sorts and can at least arrange local tours and transport if not more. Communication: India has become much stricter since the 2008 Mumbai terror attacks so purchasing a SIM card required a copy of our passports and visas, submission of passport photos and a little waiting. We had to fill out a lengthy form and provide a local address. Then we had to dial a number and verify our name, father’s or husband’s name and local address. We purchased Airtel SIM cards at Shop n Save on Princess Street in Fort Cochin. They were helpful and made the photocopies for us. We paid Rs 399 which covered the connection fee plus value on the card, and it was easy to refill the cards there and should be elsewhere, too. WiFi is widely available though connections have been slow. Transport: After hearing a pre-paid taxi would cost Rs 990, we took one of the nice, orange AC buses from the airport for Rs 76 each to Fort Cochin. Once there, we walked or used tuk-tuks which are everywhere in India. Private cars can usually be arranged with ease and of course are much less expensive than in the US. For example, getting from the backwaters to our hotel past Munnar we paid Rs 10/km (though at least on this route we had to double the count, i.e. for the driver’s return), which equated to Rs 3,400 for a 5+ hour trip. There are lots of buses and trains, and conventional wisdom is that the train is a much more pleasant experience. We also have multiple internal flights planned. In addition to all the usual sites like Kayak, www.makemytrip.com may be a good resource. We also considered Delight, Walton’s and Bernard Bungalow. Around the corner from Chiramel is the Malabar House where we dined one night. This Relais & Chateaux boutique hotel seemed lovely. Brunton Boatyard is another more high end option. Attractions: Check opening times because, e.g., the synagogue is closed daily from 12-3 pm. Entrance fees were negligible, usually Rs 5-10. Photos are not allowed inside the synagogue, the indoor parts of the Jain Temple or the Dutch Palace. Our hotel booked the kathakali show for us and secured seats 7-8 in the front row. This meant a little neck-craning but was the best vantage point for make-up and the sand painting. Tickets were Rs 300 each. There are a few other places in town that also have performances. This entry was posted in Asia, India, Kochi, Uncategorized and tagged Cochin, India, kerala, Kochi on December 22, 2013 by aleavitt77.